On Wednesday 21 March, Richard Teare spoke at a meeting convened by Dr Norma Taylor, President, GULL Jamaica. The main purpose of the meeting was to brief church pastors and others with an interest in community mobilization on the possibilities for cascading GULL to Jamaica’s marginalized rural and urban communities. On Thursday 22 March, Dr Lee Bailey, Norma Taylor and Richard Teare introduced GULL to senior officers at the St James Police headquarters in Montego Bay. The Police Service are keen to use GULL’s action learning approach in support of personal and professional development and Norma will facilitate the first group. Profile: GULL Elder, Dr Crosswell Taylor, O.D. 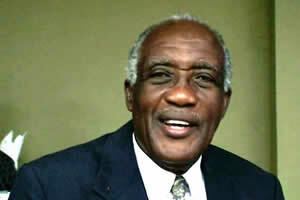 In March 2012, Crosswell Richard Taylor was nominated as a GULL Elder in recognition of his personal commitment to lifelong learning, service to education and the community and his support for GULL in Jamaica. Crosswell graduated from the University of the West Indies where he majored in Chemistry and Zoology and he went on to complete a post graduate Diploma in Education. Thereafter Dr Taylor enjoyed a long and rewarding career in education, culminating in his appointment as Principal of Cornwall College, a position he held for 14 years. He also founded the Cornwall College Evening Institute which plays a significant role in providing access to continuing education. Now retired, Crosswell currently heads the Calvary Baptist Church Evening Institute and he has authored several publications to assist students with their learning journey. (Right) GULL Elder, Dr Crosswell Taylor, O.D. Ruddy Alexander Khani completed his GULL Doctor of Management pathway by compiling ‘The definitive sanitation guide for the food service industry’ an incremental study drawing on Dr Khani’s prior management experience combined with new material which was tested, refined and applied at the Wexford Hotel, Montego Bay. Dr Khani’s project encompassed aspects of the history of sanitation; definitions and terminology; principles of sanitation management; best practices; purchasing, receiving and storing procedures; food protection; food temperature management; personal hygiene for food handlers; recycling; aspects of microbiology; insect and rodent control and aspects of waste management. Dr Khani’s supervisor comments: The outcome is a framework for systematically analyzing the interrelated control points in a food service operation. The approach was developed, tested and refined over several years and it addresses three objectives: (1) Analysis of the opportunities and challenges facing stakeholders as they strive to maximize customer, employee and owner satisfaction; (2) It enables employees, managers and owners to establish a sanitation risk management process and (3) to reduce risks while improving the operation’s bottom line. On Saturday 24 March, a ceremony took place at Sandals Montego Bay to recognize the work of Junior Gordon, a long-serving General Manager at Sandals Resorts International. Junior led an action learning cascade at the Grand Pineapple Beach Resort from the GULL launch in 2009 through until 2012. Among other initiatives, Junior focused on the development of a work experience programme for school leavers. What did I learn and how will my learning help others? Introducing GULL’s action learning approach to our team members over the past few years has taught me a lot about the complexities of human psychology and their DNA. My objective was to enrol all resort team members in the GULL process. The campaign to orientate team members generated many discussions which in itself was an encouragement to proceed. At the outset, all team members were mandated to reflect daily on five departmental tasks using a note book provided by the resort. This exercise gave me a rich insight in relation to the sense of fear that some of our team members experienced when asked to express themselves in writing. Among many other things, I learnt that coercing someone to engage in self-development does not work. The sport of Fencing illustrates a good strategy in this respect as constant probing is needed to penetrate the defences of a reluctant learner. I am optimistic though that my personal achievements will impacts on others in a positive way. The ‘never too old to learn’ philosophy really comes to the fore in the context of lifelong learning.